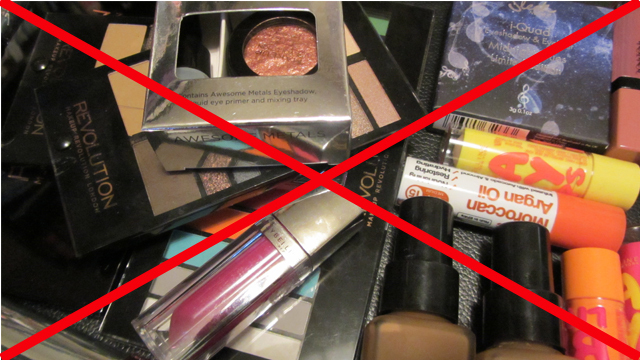 I am now on an epic makeup spending ban. How epic? Until 30th September epic! I started blogging partly to make use of all of the makeup I have. Instead, I have probably quadrupled my collection. So that I can regain some appreciation, subject to some exceptions I will not be buying makeup (or nail polish). *I can spend Boots Advantage Card points as the reason I collect them is to spend them on makeup. *I can buy my summer foundation, preferably with points, because the correct shade is a necessity. *I can buy a waterproof mascara for wedding season, preferably with points, because wedding photos last forever and looking like a smudgy mess is not an option. *I can buy magazines with makeup as a free gift as long as a genuinely want to read the magazine. *I can enter competitions to win makeup as I will not be spending the cash I am trying to save. *I can replace a product that has run out or expired with the exact same product. *If my bridesmaid duties dictate that I need a shade that is not already in my collection, I can get this, preferably with points. Wish me luck – I really need it!